We are excited to announce the implementation of the Swim Lessons University’s brand new Swim Lessons Awards Progression & Water Safety System! 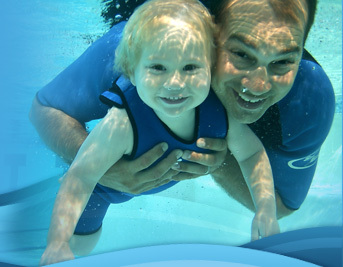 Now, your students too can benefit from yet another unique feature of the Swim Lessons University program. 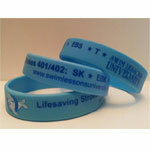 The Swim Lessons University Awards Progression features a swim bracelet system that is an immediate, effective, and fun way to recognize your students’ progress. Even more importantly, you will find the color-coded water safety system is yet another means of educating parents on swim safety and drowning prevention. Upon arrival for your student’s first swimming class, you (the instructor) present the child with the appropriate colored, waterproof bracelet (the type used in the popular Lance Armstrong “LIVESTRONG” campaign). 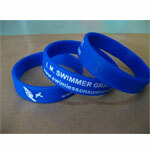 The bracelet’s color is determined by the Swim Lessons University course that you have determined to be best suited for the child, i.e., Swim 101, Swim Strokes 201, Advanced Strokes 301, etc. 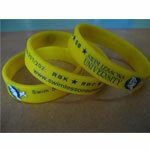 In addition, each skill in which your student will learn in the course is abbreviated and printed on the bracelet next to a star. When your student masters the skill, you use your “special star puncher” and punch out the star next to the new skill the child has demonstrated he/she has learned. Upon successful completion of each skill abbreviated on the child’s present bracelet, you then present your student with the next bracelet, which is a new color with a new set of skills. This, of course, is how you advance and graduate your student to the next level/course. 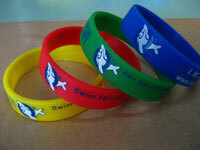 Not only do the bracelets serve as a reward, they also serve as an indicator of the child’s skill level, similar to the karate belt system, which brings us to the unique water safety aspect of bracelet system. 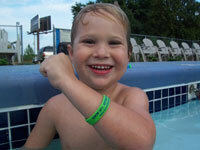 "Touch supervision" be employed at all times when this child is in or around the water. A U.S. Coast Guard approved Lifejacket should be used anytime touch supervision is not possible. 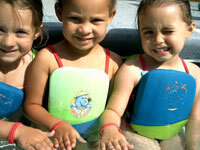 "Close and constant supervision" should always be employed when the child is in or around the water. A U.S. Coast Guard approved Lifejacket should be used anytime "close and constant" supervision is not possible. "Constant supervision" should still be employed when the child is in or around the water. While a U.S. Coast Guard approved Lifejacket is not required, if the child is under constant supervision around a swimming pool, it is still strongly recommended that when the child is around a body of water such as a lake or river. "Constant adult supervision" is always recommended for children under the age of 16. If a lifeguard is not present, a buddy system should be used for those ages 16 and older who have earned the blue bracelet. Scissors Kick (SK) - Performs Scissors kick for 30 feet. Elementary Backstroke Kick (EBK) - Performs the Elementary Backstroke kick for 30 feet. Sidestroke (SS) - Performs the Sidestroke for 30 feet. 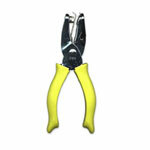 Treading (T) - Treads water for 60 seconds using either the scissors, whip or eggbeater kick. Star Puncher for Awards Bracelet: Instantly reward your students when they master a new skill by using our 1/4-inch Star Puncher! When your students master a new skill, simply use this handy star puncher to punch out the star beside the abbreviated skill! 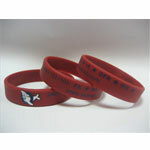 When should students wear their Awards Bracelets? 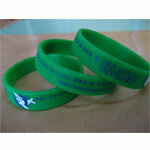 Encourage students to wear their bracelet to every class! This provides the you or the instructor with instant information about the student’s skills. For example, do you have a 1-Star Swim 101 student or a 5-Star Swim 101 student? Just as important, you can instantly reward your student when he/she masters a new skill. 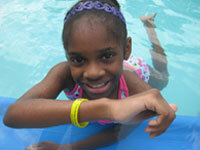 Even better yet—encourage your students to wear their bracelets to and from the pool. Children will be very proud of their bracelets and parents can share their child’s accomplishments with their friends and relatives! It is important to remind parents to focus on what their child has accomplished, and avoid pressuring the child about what he or she hasn’t yet mastered. The backbone of the bracelet awards idea is that it is a reward system and it should be just that: A reward! What Skills are the 6 Major Skills Abbreviated on each Awards Bracelet? 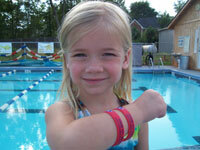 There are six (6) skill abbreviations and stars in Swim 101 (ages 3-5). 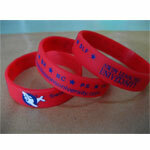 Upon graduation, a yellow bracelet is awarded when the child masters the sixth and final skill: “Independent Pop-up Breathing” during a basic surface swim. The surface swim with pop-up style breathing is essentially a basic swim at the surface of the water with the face in the water. The swimmer should be primarily swimming in a horizontal position, although some change in body position is expected during the breath. The important thing is that the breath is taken comfortably and without struggle or hesitation, and that the child resumes swimming in the horizontal position after each breath. Swim 101: Front Kick (FK)- Performs the front kick with noodle (Swim 101) for 15 feet. Swim 101: Back Kick (BK)- Performs the back kick with noodle for 15 feet. Swim 101: Breath Control (BC) - Performs 3 comfortable submersions. Swim 101: In-line Kick (IK)- Performs the in-line kick with barbell, face in the water, for 3 seconds. There are six (6) skill abbreviations and stars in Swim 102/Swim 103, with a yellow bracelet awarded upon graduation for mastering the sixth and final skill: Independent Freestyle. Independent Freestyle means that the student can perform a basic overarm front crawl for 25-30 feet with the face in the water without the SwimWays Power Swimmer or other approved flotation aide. Dependent Freestyle means that the student can perform a basic overarm front crawl for 25-30 feet with the face in the water but still needs the flotation aide. Swim 102/103: Front Kick (FK)- Performs the front kick with the kickboard for 25-30 feet. Swim 102/103: Back Kick (BK) - Performs the back kick with noodle for 25-30 feet. Swim 102/103: Breath Control (BC) - Performs 3 comfortable submersions. Swim 102/103: In-line Kick (IK)- Performs the in-line kick with barbell, face in the water, for 3 seconds. Swim 201/202: Refined In-line Kick (RIK)- Performs the in-line kick without buoyancy equipment. Swim 201/202: Refined Back Kick (RBK) - Performs the back kick without buoyancy equipment. Swim 201/202: Refined Breath Control (RBC) - Performs 10 consecutive rhythmic bobs. Swim 201/202: Backstroke (BS) - Performs the backstroke for 25 feet. Swim 201/202: Freestyle (FS)- Performs the freestyle for 25 feet (no side breathing required). Swim 201/202: Side Breathing (SB) - Performs the freestyle with side breathing for 25 feet. Swim 301/302: Refined Side Breathing in Freestyle (RSB) - Performs freestyle with side breathing for 30 feet. Swim 301/302: Refined Back Stroke (RBS) - Performs backstroke for 30 feet. Swim 301/302: Butterfly Kick (BUK) - Performs the butterfly kick for 30 feet. Swim 301/302: Breaststroke Kick (BK) - Performs the breaststroke kick for 30 feet. Swim 301/302: Butterfly (BUS) - Performs the butterfly stroke for 30 feet. Swim 301/302: Breaststroke (BRS) - Performs the breaststroke for 30 feet. This is the graduation bracelet awarded for mastering all skills including a 40 yard I.M. I.M. Swimmer: Graduation (blue) - Performs 40 yard Individual Medley (I.M.). 10 yards of each stroke: butterfly, backstroke, breaststroke, and freestyle. Should teachers change the lesson plan once a student masters one of the six skills? At Swim Lessons University, we do not alter the lesson plan because a certain skill is mastered for two reasons. One reason is “skill transfer.” The skills that a child develops on one exercise will transfer another. For example, improving one’s breath holding and freestyle kicking skills transfers to the in-line kick, which transfers to the swim. Just because a child can freestyle kick doesn’t mean you should eliminate the kicking exercise. In addition, as the individual skills improve from isolated practice, so your student’s final product. A second reason is “confidence transfer.” When a child becomes “good” at a particular skill, the confidence the child gains from being successful at that skill will lead to his/her confidence and determination that he/she can get learn a skill he/she currently isn’t so good proficient at yet. When instructors spend too much time working only on the skills that the child can’t do, students tend lose confidence in themselves and become frustrated. Finally, every skill — even those that are acknowledged through awards —can still be improved. Michael Phelps, arguably the best swimmer ever, still practices his freestyle kick with a kickboard every day!